Axes and hatchets are important tools, even in this modern world. Log burners are very trendy and are also very efficient ways of heating a house. If you want to use one of these, you will need to get an ax to be able to cut wood down to a useable size. They are also great for use during camping for similar reasons, and or basic woodworking where you can downsize the log to what you need. View the Best Axe on the Market, Below. How do you Throw an Axe? How do you Replace an Axe Handle? There is of course ax throwing as well, which is increasing in popularity as a competitive sport. 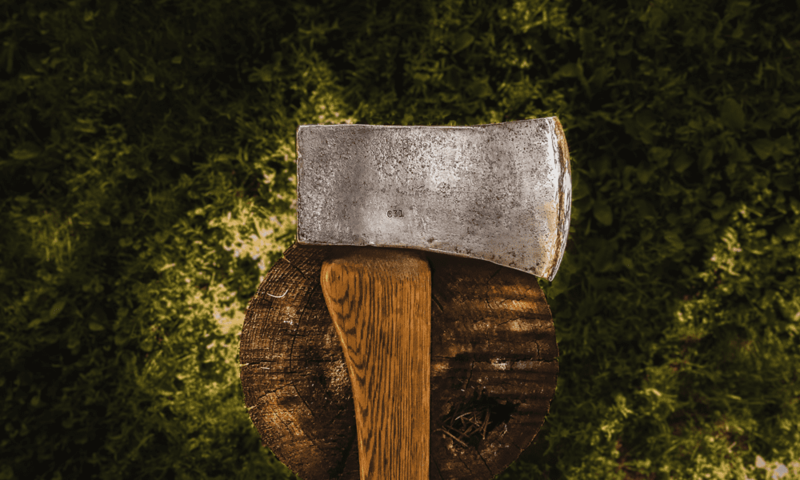 The huge range of axes and hatchets on the market can make it seem impossible to find the perfect one, but luckily we have done some of the research for you. We consulted experts, bloggers and customer reviews to bring you this list of the top 10 best axes and hatchets currently available online – as well as information on what factors to consider before you buy. This ax from Fiskars has been awarded Amazon's Choice for axes thanks to excellent customer reviews and a sturdy design. It is particularly good for all users, as it is 36 inches in total and will easily cut through larger logs. It is designed to make sure you can cut as many logs as possible in a single strike, and the handle is weighted to make sure it has a balanced feel when held properly. This ax is such high quality that Fiskars provide a one year warranty with it. It weighs a total of 5.85 pounds, so is easy enough to carry but also heavy enough to make its way through tougher logs. According to customer reviews, these axes last for a very long time. This is a very powerful all-rounder and, for the price, has plenty of great features. If you are looking for an ax that makes chopping logs easier, this is a great starting point. Aiming for a more traditional vibe? This beautiful ax is handmade in Wuppertal, Germany and has a very classic look to it. The wood itself is Grade A American Hickory, is carved in Switzerland and then sent to Germany where the precision-crafted blade is attached. The blade is made out of German carbon steel and requires less maintenance than other blades. A tanned leather sheath is included, which is handmade in the United States. The blade is heat treated, and the handle is sanded and oiled, for ultimate durability. This is Amazon's Choice for forest ax and it is easy to see why - simply wielding this will take you back to a simpler time. It is 3.5 pounds in weight, so is quite light to carry and easy to work with. See more information on Helko Werk Germany 1844 Forest Woodworker. Though not as powerful as some of the other axes, this is an excellent aesthetic choice with a classic look that really adds to the atmosphere of chopping your own logs. This 14-inch hatchet is perfect if you are looking for something you can use with just one hand. It has been awarded Amazon's Choice for hatchets thanks to excellent customer reviews and a great reputation. It is perfect for kindling, and small to medium sized logs for building a small fire. It is designed to be comfortable to use, with an ergonomic handle and comfortable balance. The blade is weighted so it cuts deeper every time you hit the log, so should get through most medium sized logs in no more than a couple of hits. As with other Fiskars products, a lifetime warranty is included to reassure you of the excellent quality of this hatchet. It is designed to be quite sharp, and customers love how easy it is to use. 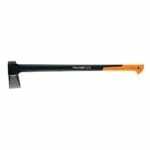 See more information on Fiskars X7 Hatchet. If you are just looking for a small hatchet, this is a fantastic option. It is durable, comfortable and comes with a lifetime warranty to ensure that if anything goes wrong you can easily get a replacement. Looking for something with a bit more power behind it? This Fiskars ax is designed to be able to fell trees in seconds and is an excellent product for more heavy duty tasks. Also awarded Amazon's Choice for axes, it comes with many great customer reviews and will make light work of large logs. It is designed so that each hit cuts even deeper than the last. The blade is hardened during the manufacturing process to make sure it lasts longer than many other axes before needing to be sharpened. The edge is already very sharp, to begin with, and will stay that way for a long time - even with extended use. It is well balanced for use with two hands and is a perfect choice if you need something to cut down entire trees in a quick amount of time. See more information on Fiskars 375581-1001 Chopping Axe. This is an excellent option if you just need an ax with a lot of power. It can fell entire trees with enough time and patience, though will make light work of most trees that the average person will need to cut down. This hatchet comes fully endorsed by Bear Grylls and would make an excellent gift for the survivalist in your life. The blade is 3.5 inches, allowing for more precise cuts to be made than with the larger blades. As with most hatchets, it will easily make its way through small logs and kindling wood. The handle is ergonomically designed for comfort and made with non-slip rubber for easy use. It has been extensively tested out in the wild before being released in order to receive approval from Bear Grylls himself. A nylon sheath is included which is made out of a special material that prevents mildew and mold from gathering. The blade is made out of high carbon steel for the ultimate in durability. See more information on Gerber 31-002070 Hatchet. If you are considering an ax or hatchet as a unique gift for someone on the outdoorsy side, look no further than this hatchet. It gets the job done, is very durable and comes endorsed by Bear Grylls himself. This ax is specifically designed for splitting logs down the middle, which is perfect for quickly arranging firewood. At 27 inches, it is well sized for making its way through larger logs and thicker chunks of wood. The handle is made with a sturdy composite fiberglass which ensures it will last forever without splitting. It also has a hammer on the reverse side, which is great for smashing through logs that are already halfway split. Most of the weight is balanced on the head of the ax, giving full power behind the blade to make sure chops are as efficient as they can be. The blade is made out of reinforced steel for ideal durability and strength. See more information on Husqvarna S2800 Composite Splitting Axe. If you simply need to split thicker logs for firewood, this is a very reliable model. It is durable, well weighted, and will make light work of most logs you will need for indoor purposes. This is a slightly longer ax at 23.5 inches which is great for taller users or simply if you need a little bit more force behind hits. It is designed for felling trees, so will work through most tasks you could possibly need an ax for. Like all Fiskars axes, it is designed so it will hit deeper into the wood with each swing. The handle is made with composite fibers which are stronger than the steelhead to help absorb the shock and prevent damage. The blade is made with carbon steel and is weighted so you get a comfortable swing as well as a good chop. It is ergonomically designed for ultimate comfort, and customer reviews love how easy this ax is to use. See more information on Fiskars X15 Chopping Axe. This is another fantastic option for completely cutting own trees, and is a very powerful ax for a much more reasonable price than other tree-felling axes. It is comfortable to use, and very durable. Axe s are handy tools for taking a long camping, and this Estwing ax is Amazon's Choice for camping axes due to excellent customer reviews and the great company reputation. It is made out of a single piece to make sure it stays together and provides maximum force. There is a leather grip on the bottom half to make sure it stays comfortably in the hand and allows you to use it safely and with ease. Estwing design all of their tools in the United States so you know it has stood up well against American safety and manufacturing standards. A nylon sheath is included, which helps to protect the blade against damage and ensures it retains its sharpness for as long as possible. It is the perfect hatchet for cutting firewood and smaller logs. See more information on Estwing Camper’s Axe. Camping hatchets are a great option if you only need to use it occasionally for outdoor activities, and this is one of the best available. It is very sturdy, and it is a great product to purchase to support US manufacturing. Is the survivalist in your life not impressed with Bear Grylls branded products? This is another excellent survival axe and has been awarded Amazon's Choice for the survival ax category. It comes with two ax blades and extendable handles, meaning it can be perfectly customized to the user. It also has a compass, and one of the axes can be used to start a fire. The ax comes with a leather sheath making it safe to carry and protecting the blade. It has a lifetime guarantee attached, meaning you can be sure of the quality. Despite having all of this, it also comes in at a very budget-friendly price point, making it a great option if you are looking for a unique gift in the form of a survival ax. It also has bottle opening, whistle, and fish scaling tools, amongst a whole host of other cool features. See more information on IUNIO Multi-Tool Hatchet Survival Kit. If you are looking for a bargain, look no further than the IUNIO Camping Axe. This has everything you could possibly need from a survival tool and comes in at an excellent price. If you simply need an ax for camping or are looking for a unique gift, this is a fantastic option. This camping hatchet is another great option from the Estwing range. It comes in at fourteen inches, which is perfect if you are looking for a tool that can be used one handed but still has plenty of power behind it. Like the other single hatchet from Estwing, it is made out of a single piece of carbon steel which allows it to stay sturdy and prevents any risk of snapping. The handle is then covered with a leather grip which keeps it firmly within your hands throughout use and ads a sleek finish. All Estwing tools are made in the United States, so this not only conforms to manufacturing and safety standards but also helps support the local industry. The sheath included is very hard wearing and will keep the blade mold and mildew-free throughout the lifetime of the product. This is great for small to medium sized logs, as well as kindling branches. See more information on Estwing E24ASEA Sportsman’s Axe. Like the previous Estwing ax on this list, this is a great quality camping ax, and also comes in a very cool style. It is produced in the US, so is excellent if you are looking to support local industry and ensure high quality. Our final selection from Estwing is a little bit different as it comes with a double sided blade. This gives it a cool, medieval feel to it and allows you to switch between blades for multiple purposes, helping to keep both blades sharper for longer. The included nylon sheath covers both blades and helps to protect them against mildew, mould, and forces which may blunt it. The grip at the bottom is designed to reduce the shock force that travels up the handle when in use. It is great for chopping small to medium logs and splitting large logs for use in a fire. As with all of the other Estwing products, it is fully made in the United States - conforming to local manufacturing standards and contributing to the nation's economy. See more information on Estwing EBDBA Double Bit Axe. Just like the other Estwing products, this is entirely made in their Illinois factory helping to contribute to the United States manufacturing industry. It is very high quality, and the double-sided blade will last longer than a lot of their single-sided hatchets. Made in the style of a Native American Tomahawk, this hatchet is very powerful and comes with a hammer on the opposite side. This makes splitting logs easier and adds more functionality to the blade. The handle is made entirely out of Tennessee Hickory wood and is fully sanded and treated to ensure it remains sturdy. The blade is made out of carbon steel. The multiple functions of this ax make it a great option for camping, survival scenarios and even for regular wood chopping for fires. It can chop most medium sized logs with ease and can even make its way through logs larger than other similarly sized hatchets. It is also a very attractive design and will sit pride of place in your tool collection. See more information on CRKT 2730 Chogan Tomahawk Axe. For an all in one camping and log cutting tool, this is an excellent option. It comes in at a decent price and has such a powerful force behind it thanks to the hammer and quality craftsmanship. If you want to be able to hold it in one hand, you want a hatchet. If you need to work on bigger jobs, you need an ax. Hatchets are anything 14 inches long or under, with axes being anything over that 14-inch mark. If you are only going to be working on kindling or small logs, then a hatchet is probably your best option. These are safer to use if you are not used to working with axes, and are usually designed to make easy work out of smaller jobs anyway. If you have big tasks to work on, especially thicker logs that need splitting, then get a full-sized ax. These also vary slightly in what they can and cannot cut, so make sure to double check the description and reviews. It goes without saying that you want to be able to use the ax safely without injuring yourself. There are a number of features that can help with this. First of all, if you can get one with a grip at the base this will help it stay in your hand and ultimately improve the steadiness when you are working with it. You should also make sure it is a reputable company, and that they comply with United States manufacturing and safety standards. In terms of durability – stainless steel blades will last longer and will be less likely to rust over time. Solid handles are also an excellent option, and with modern technology, they come in a variety of far stronger materials than the traditional wood. If you do opt for a wooden one, try to get one that is sanded and varnished to help reinforce its strength. Finally, where possible try to get an ax or hatchet that comes with a warranty. These vary anywhere from a few months to an entire lifetime, and you should aim to get one that lasts as long as possible. These protect you against general wear and tear and assure you that you will get a replacement if the original breaks for any reason that was not your own fault. It is also a good sign that the company trusts their own product. Companies are hesitant to spend a lot of money replacing broken items, and will only provide a warranty if they genuinely believe most customers will not need it. First and foremost, it is important to understand that whilst you do want a sharp ax, it should not be as razor sharp as you would expect a knife to be – this will wear down and blunt a lot quicker than regular sharpening would happen. Your first step should be to file the edge – this will remove any nicks and other irregularities. Do not file too fast, take it slow so you do not ruin the file. Always stroke the file away from you. You can purchase special files for axes, which we highly recommend. You can also lightly treat the ax with oil or wax to help protect it against rust. If you want to throw an ax competitively or simply as a game with other ax enthusiasts, it’s important to know the right technique so you can do it safely. Your bottom hand should be your strongest hand and will grip it like it would grip a baseball bat. Your top hand will grip in the same manner, just on top of the bottom hand. The blade should be completely straight pointing in front of you. You can then swing back (overhead) and then release as you bring the ax back forward. We suggest practicing with a hatchet first, which can be thrown using a similar technique but with one hand. Release the hatchet when your arm is in a straight line, parallel to the ground. If you ever break an ax handle, your only options are to get a new ax entirely or to replace the handle. Never try to fix the handle back together as it just won’t work. To remove the old handle, saw it off until the head. Soak the blade in the water, which will expand the wood. The wood will then shrink when it dries, making it easier to remove. Fit the head to a vice, and clear out any wood pieces that remain. Sand the edges of the new handle down so it just fits in, but you should need to put a bit of effort to push it in. Once it is in, a strong hammer in a metal wedge to expand the wood. If you are not confident of your abilities, consider asking someone else to do it or buy a new ax entirely. The range of axes and hatchets available is vast. We suggest having a think about what kind of tasks you need to perform with the ax first before going ahead and purchasing. If you want to save money, we suggest cutting costs on the size and additional features. Never compromise on safety or quality of materials – it will just cost you more in the long run either through replacement costs or even medical costs. This list merely serves as a guide to what the best options are. 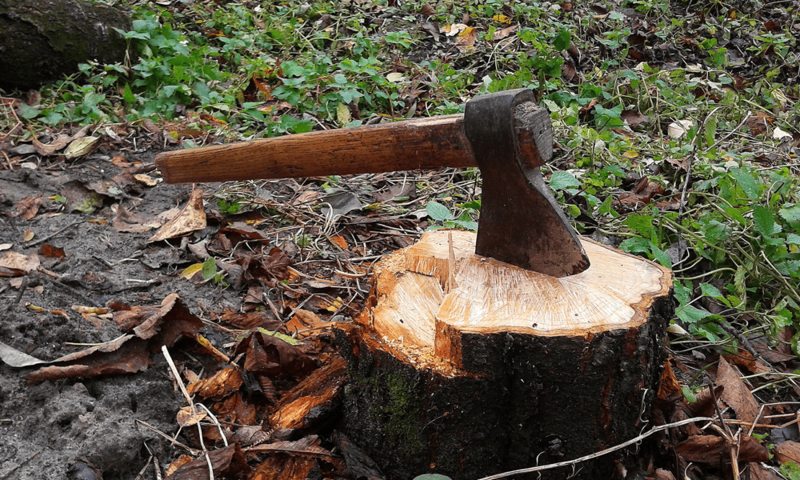 There are thousands of great axes and hatchets out there, and we’re sure if you follow our tips you will be able to find the perfect product for you. As always, be sure to double check customer reviews before every purchase so you know the manufacturer is able to live up to the claims they are making. 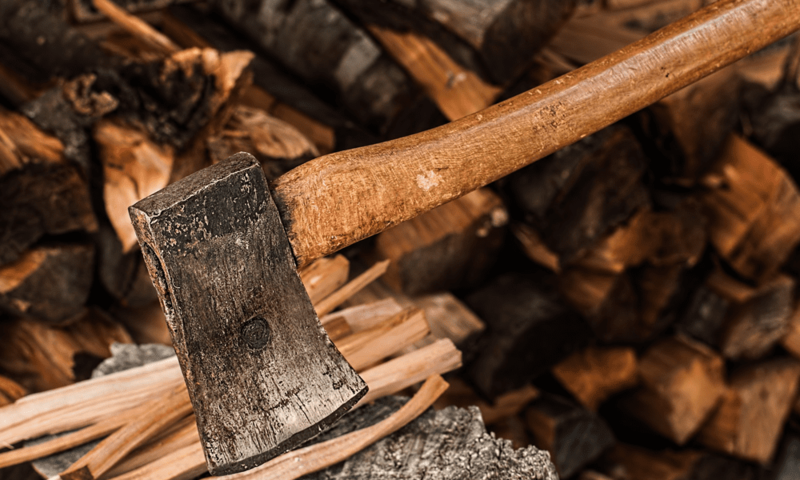 The best way to save money is to consider getting a hatchet instead of a full-sized ax. Most households won’t need anything more than this unless you find yourself regularly cutting huge logs. We hope you enjoyed our article on "12 Best Axes in 2019", if so, please share and rate it.